Just days after the launch of its flagship S10 series, Samsung is rolling out the first software update for the Galaxy S10+. This new update improves camera stability, bring miscellaneous bug fixes, improved device stability and a lot more. The new software update also gives Galaxy S10+ users the ability to remap the Bixby button to launch any application on the smartphone. Once the button is remapped, users can simply press the Bixby button and launch the application they want. 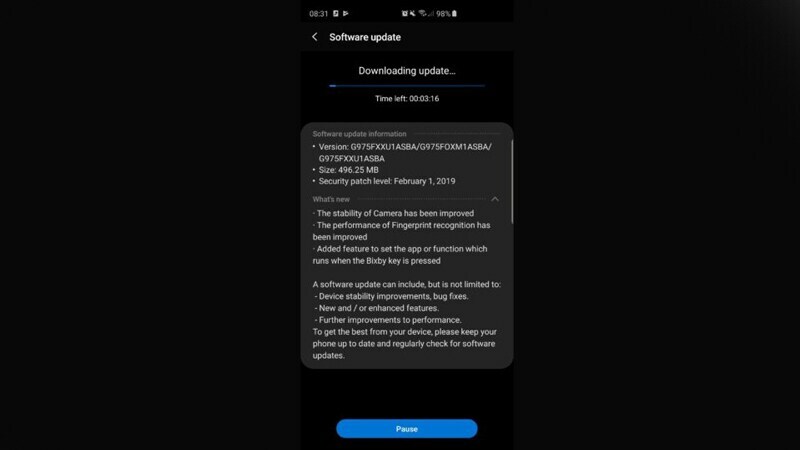 According to reports, the update is currently rolling out and also brings the February Android security patch with it. This upgrade also fixes critical and as well as high-risk vulnerabilities in Android OS, as well as twelve unique to Samsung's own firmware. In the monthly routine security maintenance release that Samsung puts out, they have listed these bugs as critical. Along with the bug fixes, Samsung also mentions that the performance of the fingerprint recognition is improved. The Galaxy S10+ uses an in-display ultrasonic fingerprint scanner and not a traditional capacitive fingerprint sensor. This update also enables Instagram Mode, a feature that lets Galaxy S10+ users capture and upload to Instagram Stories by using the stock camera client. We tried looking for the software update on our Galaxy S10+ review unit but it hasn't hit the device yet. The Galaxy S10+ is currently available on pre-order in India and will launch on March 6th 2019. The Galaxy S10 series starts at Rs. 55,900 for the lone Galaxy S10e, and goes all the way up to Rs. 1,17,900 for the top of the line Samsung Galaxy S10+. If you have pre-booked a Galaxy S10+, you could find this software update waiting for you when you unbox it.